I wanted to give a exhaustive description and defintion of Sciatica so i did some research and found a site sciatca.org and posted information below. enjoy! In the literature of 15th Century Florence, the term sciatica described pain at the ischial tuberosity. Tuberculosis and arthritis were cited as suspected causes. Historically, a broad and varying definition suggested unclear pathogenesis. Distal pedal pain due to intermittent claudication and nerve entrapment at the fibular head are now termed “pseudo-sciatica” and “peroneal palsy,” respectively, but they have often been mistaken for sciatica. More recently, similar symptoms deriving from thalamic cerebrovascular accident, multiple sclerosis, thoracic spinal fracture, and “phantom limb” phenomena have been called sciatica because they share a similar distribution of pain. Symptoms from these causes differ from our core concept in that they involve only the neurons in the central nervous system. While a patient may accurately describe the pain as “sciatic,” the word would describe only the symptom and not the common pathophysiology. We suggest that a CVA in the conus medullaris might be a limiting example of true sciatica if it involved the lower motor and sensory neurons, but question whether anything more rostral could be true sciatica. Another borderline case would be a (rare) mononeuropathy multiplex involving the proximal sciatic nerve. Due to variance in definition, studies putting the lifetime prevalence of ‘generic sciatica’ at 35% must be interpreted cautiously.2,3,4 Two independent studies with more precise definitions similar to ours yield lifetime prevalence of true nerve-related sciatica at 5% in men and 4% in women. 5,6 It is thought that back pain affects approximately 14% of adults annually; about 1-2% also have sciatica. 7 This amounts to 13% of 40,000,000 back pain cases per year: more than 5,000,000 cases annually. Three pathogenic groups contain the common causes of sciatica. There are also a number of infrequent causes as well as a short list of habitual impostors. Differential diagnosis begins with the location of the pain and the accompanying symptoms and signs. Note: Physical therapists often treat each of these conditions with McKenzie exercises appropriate for the level and severity of injury. *Adapted from Fishman LM, Ardman CA. Sciatica Solutions: Diagnosis, treatment and cure of spinal and piriformis problems. W.W. Norton. New York. 2006. Prediagnostic treatment for sciatica: Given the painful nature of sciatica, analgesia often precedes diagnostic workup. Many patients have already started a pain control regimen with ibuprofen or another over-the-counter non-steroidal anti-inflammatory by the time they reach the doctor. Nonsteroidal analgesia can be used in ascending order of potency: Tramadol (g of ultram), acetaminophen (g), meloxicam (g of mobic), celecoxib (g of celebrex), ketorolac (g toradol), diclofenac (g of voltaren), indomethacin (g). If ineffective, propoxyphene HCl (g of darvon), acetaminophen/hydrocodone (g of vicodin), meperidine (g of Demerol), codeine, acetaminophen/codeine (g of Tylenol #3), acetaminophen/oxycodone (g of Percocet), hydromorphone (g of Dilaudid), and oxymorphone (g of Opana) can be utilized. It should be noted that some common synthetic and semi-synthetic opiates include enough acetaminophen to approach hepatotoxicity at prolonged higher dosages. Practical diagnosis: The diverse etiology of sciatica makes it necessary to be comprehensive and precise when evaluating a patient. Many clinicians rely on imaging early on in a patient’s treatment. Plain radiographs are rarely useful in the initial evaluation of non-geriatric acute back pain. They do not reveal herniated intervertebral discs nor spinal stenosis, and the findings on plain films are often unrelated to symptoms. E.g., spondylolisthesis can be seen in up to 5 percent of normal subjects. 8 Immediate X-ray of the lumbar spine should be reserved for patients with alarm symptoms suggestive of infection, cancer, violent wounds or fracture; however, a normal plain film itself does not rule out these conditions. In general, MRI or CT and EMG are required for definitive diagnosis of many spinal conditions. Nonetheless, these studies are not acutely necessary in patients with sciatica unless major neurological deficits or severe pain are present. Imaging studies may sometimes be deferred until 4-6 weeks of conservative therapy have failed. Once obtained, there can still be an issue of misdiagnosis. One well-known study found that more than 30% of a group of pain-free subjects had serious spinal abnormalities on their MRIs. 9 If spinal pathology can be painless, it can also coexist with sciatica that has a different cause. This prompts the clinician to use EMG as an extension of the history and physical exam to confirm the diagnosis. Herniated Nucleus Pulposus: Whether central or lateral, usual treatment begins with analgesia and McKenzie and manual medical techniques, extension exercises, paraspinal myofascial work, modalities, Alexander work, and/or Yoga. Tapering oral steroids (starting dose often dexamethasone 8 – 16mg) over a 6-day to 3 week period may dramatically lower a patient’s pain, enabling him or her to tolerate an effective therapy program. Translaminar or transforaminal epidural injections are sometimes beneficial, though studies demonstrating the efficacy of these common practices are lacking. True disc-related sciatica has a very high morbidity. This makes surgery an appealing alternative to conservative treatment for some patients. Many studies support surgery as the most efficient treatment. One analysis of medication use, ability to return to work, leisure activity and pain score found that after the first year of treatment, 30% of conservatively treated patients were satisfied with their outcome, while 60% of surgically treated patients reported satisfaction. 10 Surgery continued to lead until differences became insignificant at 10 years and beyond. Another study found 99.99% identical outcomes in surgical and non-surgical patients after 10 years. 11 It should be noted that in most studies the more severely involved patients tended to enter the surgical group. Surgery may be an appealing option for many patients given the generally more favorable outcome. However, a recent study found little risk of serious or permanent injury when surgery for simple sciatica was delayed more than 7 months. 13 Given this information, a rational approach to treating sciatica clearly caused by a herniated disc is to attempt conservative treatment for 4-6 weeks. If intractable pain persists, a microdiscectomy or similar procedure can reasonably proceed. Anterior spondylolisthesis, the most common form of spondylolisthesis, in which the upper vertebra is moved forward relative to the one below, may cause radiculopathy if it truncates neuroforamina, and/or spinal stenosis if the intramedullary space is narrowed. It is graded I through IV by the quartiles of vertebral body displacement. It is often successfully treated with an abdominal binder or lumbosacral corset, abdominal strengthening and postural training (the latter by a physical therapist or Alexander therapist). Yoga and Feldenkreis are also helpful. Beyond grade II, be it antero- retro- or lateral listhesis, surgical procedures that reestablish the proper alignment often utilize hardware such as titanium cages, and usually meet with considerable, but sub-total improvement that may not last more than 4-5 years. Studies of conservative medical, chiropractic or surgical treatment of spondylolisthesis are few. Arthritis may narrow neuroforamina to cause radiculopathy unilaterally or bilaterally at one or more levels. Often, periodic episodes of increasing severity, frequency and duration occur after age 65-70. Pain as well as motor and sensory complaints will be gradual in onset, and at least early on, are often positional. Conservative strategy reduces the attendant inflammation, lowers peripheral and central sensitization, and increases range of motion at neighboring joints to reduce compromise at the affected level(s). 14 Non-steroidal and/or steroidal anti-inflammatories, yoga, and physical therapy often accomplish these three goals, respectively. 15, 16, 17 Although quite effective, steroids must be used with caution in osteoporotic patients. More advanced or complicated cases of arthritis may require surgery to remove deteriorated bone and disc material, osteophytes, or other matter impinging on the nerves. In these refractory patients, an EMG is helpful in identifying and characterizing the levels warranting treatment, and the severity of impingement. Boney growth and/or swelling of the ligamentum flavum may narrow the lumbar intramedullary canal, causing single or multiple level spinal stenosis and resultant sciatica. The former may have genetic or arthritic pathogenesis, the latter inflammatory or traumatic. Conservative treatment aims to reduce the girth of the canal’s contents: tapered oral or epidural steroids, traction, and postural work by physical therapists, Alexander therapists and osteopathic physicians have had success. While ligamentous swelling may subside naturally, boney narrowing will not. Surgical intervention, sometimes requiring stabilization procedures as well, should be considered when a progressive boney thickening is documented, but before emergent intervention is required. Cauda equina syndrome, a rare complication of spinal stenosis in which ascending numbness or weakness and bladder or bowel incontinence results from extreme pressure on descending rootlets within the intramedullary space, is one such surgical emergency. Piriformis syndrome is an under-recognized cause of sciatica. This was validated when 239 patients who failed conservative or surgical treatment for the above causes underwent MR neurography. Piriformis involvement was found in more than 2/3 of them. 20 Symptoms arise from compression of the sciatic nerve as it exits the buttock in relation to the piriformis muscle, due to spasm or tightness in the muscle. The chief environmental causes are overuse at health clubs, from running, outdoor activities, excessive sitting, trauma from auto accidents and falls. Anomalous relationships between the sciatic nerve and the inferior gluteal artery or vein at the greater sciatic foramen are uncommon but demonstrated anatomic bases for pain. Diagnosis is made by EMG through delay of H-reflexes in flexion, adduction and internal rotation (the FAIR-test). Comparing affected with unaffected limbs helps rule out radiculopathy or spinal stenosis, and may be used in the 90% of cases that are unilateral. 21 Neural scan imaging (NMR) will show asymmetrical development of the affected piriformis muscle, and evidence of inflammation or focal narrowing of the sciatic nerve. EMG and NMR will only be positive if piriformis syndrome is present, and not in simple SI derangement alone. However, these conditions occur together with some frequency. Since the piriformis muscle arises in part from the sacroiliac joint, it is possible that SI joint derangement causes piriformis muscle spasm in these cases. The FAIR test is occasionally positive when entrapment is at a site other than the piriformis muscle. Four percent of sciatic nerve entrapment in the buttock is due to entrapment as the nerve passes close to the ischium. 26 The pudendal nerve may be separately involved. Neural scan is the definitive diagnostic tool for ischial tunnel syndrome. In these cases, treatment begins with myofascial release, modalities, and postural re-training. Surgery is reported but outcome studies lack sufficient numbers to be persuasive. Proper initial treatment for a herniated disc is extension exercises, which is contraindicated in spondylolisthesis and non-disc forms of spinal stenosis. For these spinal stenoses and spondylolistheses, flexion is standard, a treatment which is contraindicated for most herniated discs. In the occurrence of both conditions, lateral strengthening and spinal work such as the yoga pose vasisthasana have proven useful in alleviating pain, with Fonar evidence of anatomical improvement. 27 To distinguish whether spinal stenosis or neuroforaminal pathology is the major causative factor in a given patient’s pain, other provocative tests, and functionally sensitive nerve-conduction are often helpful, though currently at the experimental stage. 1 Kuslich SD, et al. "The Tissue Origin of Low Back Pain and Sciatica: A report of pain response to tissue stimulation during operations on the lumbar spine using local anesthesia." Orthop Clinic North Am 1991; 22:181-187. 2 Heliovaara M, et al. “Lumbar disc syndrome in Finland.” J Epidemiology Community Health 1987; 41:251-258. 3 Svensson HO, Andersson GBL. “A retrospective study of low back pain in 38- to 64 year old women: frequency and occurrence and impact on medical services.” Spine 1988; 13:548-522. 4 Svensson HO, Andersson GBL. “Low back pain in forty to forty-seven year old men: work history and work environment factors.” Spine 1983; 8:272-276. 5 Heliovaara M, et al. “Lumbar disc syndrome in Finland.” J Epidemiol Commun Health 1987; 41:251-258. 6 Manninen P, et al. “Incidence and risk factors of low-back pain in middle-aged farmers.” Occupational Medicine 1995; 45:141-146. 7 Deyo, RA, Tsui-Wu, YJ. “Descriptive Epidemiology of low back pain and its related medical care in the United States.” Spine 1987; 12:264. 8 Rothman RH, Simeone FA: Spondylolisthesis. The Spine 1992; Volume 1: 913-969. 9 Jensen MC, Brant-Zawadzki MN, Obuchowski N, Modic MT, Malkasian D, Ross JS. “Magnetic resonance imaging of the lumbar spine in people without back pain.” New England Journal of Medicine; 1994:69-73. 10 Weber H , '1982 Volvo Award in Clinical Science' "Lumbar Disc Herniation: A controlled, Prospective Study with Ten Years of Observation." Spine 1983; 8(2):131-140. 11 Agency for Health Care Policy and Research. Acute Low Back Problems in Adults. Clinical Practice Guidelines no. 14. Rockville, Md., 1994, Publication 95-0642. 12 Nykvist F, et al. "A prospective 5-year follow-up study of 276 patients hospitalized because of suspected lumbar disc herniation." Int. Disabil. Studies 1989; 11(2):61-67. 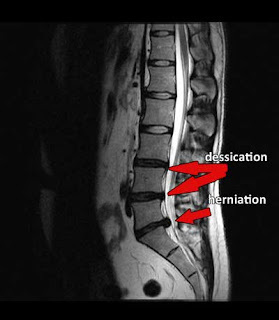 13 Carragee E, “Surgical Treatment of Lumbar Disk Disorders.” JAMA 2006; 296:2485-2487. 14 Wolff CJ, Salter MW. “Neuronal Plasticity: increasing the gain in pain.” Science. 2000; 288:1765-1768. 15 Raghuraj P, Telles S. “Effect of yoga-based and forced uninostril breathing on the autonomic nervous system.” Percept Mot Skills. 2003; 96(1):79-80. 16 Telles S, Hanumanthaiah BH, Nagarathna R, Nagendra HR. “Plasticity of motor control systems demonstrated by yoga training.” Indian J Physiol Pharmacol. 1994;38(2):143-4. 17 Williams KA, Petronis J, Smith D, Goodrich D, Wu J, Ravi N, Doyle EJ Jr, Gregory Juckett R, Munoz G, Kolar M, Gross R, Steinberg L. “Effect of Iyengar yoga therapy for chronic low back pain.” Pain. 2005; 115(1-2):107-17. 18 Atlas SJ, Deyo RA, et al. 'Long-term outcomes of surgical and nonsurgical management of sciatica secondary to a lumbar disc herniation: 10 year results from the maine lumbar spine study.' Spine 2005 Apr 15; 30(8):927-35. 19 Agency for Health Care Policy and Research. Acute Low Back Problems in Adults. Clinical Practice Guidelines no. 14. Rockville, Md., 1994, Publication 95-0642. 20 Papadopoulos, EC, Khan, SN. “Piriformis syndrome and low back pain: a new classification and review of the literature.” Orthop Clin North Am 2004; 35:65. 21 Fishman LM, Zybert PA. “Electrophysiologic evidence of piriformis syndrome.” Arch Phys Med Rehabil 1992 Apr; 73(4): 359-64. 22 Fishman L, Ardman C, Relief is in the Stretch. W.W. Norton. New York, 2005. 23 Fishman LM, Konnoth C, Rozner B. “Botulinum neurotoxin type B and physical therapy in the treatment of piriformis syndrome: a dose-finding study.” Am J Phys Med Rehabil 2004 Jan; 83(1): 42-50. 24 Mizuguchi T. “Division of the piriformis muscle for the treatment of sciatica. Postlaminectomy syndrome and osteoarthritis of the spine.” Arch Surg 1976 Jun; 111(6): 719-22. 25 Broadhurst NA, Simmons DN, Bond MJ. “ Piriformis syndrome: Correlation of muscle morphology with symptoms and signs.” Arch Phys Med Rehabil 2004 Dec; 85(12): 2036-9. 26 Filler AG, Haynes J, Jordan SE, et al. “Sciatica of nondisc origin and piriformis syndrome: diagnosis by magnetic resonance neurography and interventional magnetic resonance imaging with outcome study of resulting treatment.” J Neurosurg Spine 2005 Feb; 2(2): 99-115. I would have to disagree with some of their conclusions, especially recommendations for surgery after 7 weeks of conservative treatment. I have found that spinal decompression combined with an effective physical therapy protocol can correct most cases of sciatica within one month.